SUMMARY: One and the same scribe copied MS Venetus A of the Iliad (Venice, Bibl. Marciana, Gr. 454) and MS Milan, Bibl. Ambrosiana, B 114 sup., with Gregory of Nazianzus. Both MSS are studied in their script (with a new method of majuscule letter percentage calculation), codicological structure and ornamentation. A probable common 12th-century owner and the later history of both codices are reconstructed (A in Norman Sicily, then – 14th cent. – in Terra d’Otranto; the Ambrosian Gregory in Epirus). The arrangement of the texts, critical remarks and scholia are explained. The two MSS do not reproduce similar antigrapha. A unites text of a late-ancient codex of Iliad with Apion-Herodoros’s hypomnema. There is evidence for a supervisor. On Apion and Herodoros: these names cannot be a forgery by Eustathius, but likely go back to the sixth century. The presence of Choiroboschus in the scholia of A is not proved; the latest author quoted is Orion. Both text and commentary to the Iliad derive from the activity of a Christian Neoplatonic school, presumably Alexandrian. A was assembled on the basis of schedae containing each the commentary on 25 verses, and is an instance of Costantine’s VII patronage. Inter alia: the writer and owner of the famous Ambr. C 222 inf. was a clerk of the Department of the Sea, who wrote a Patmian document in 1195. A new edition and translation of the philological epistle of the Anonymus Londinensis is given in the Appendix. SUMMARY: In MS Venetus A of the Iliad (Venice, Bibl. Marciana, Gr. 454, 10th cent.) the script of a textual addition covered by a painted scene appears to be from the late 11th cent. (instead of late 12th, as previously supposed); the MS itself moved to Sicily by the 12th cent. and later – early 14th cent. – it is found in Terra d’Otranto, as the research of C.M. Mazzucchi has shown. The possibility of an earlier date for the illustration painted over the added text and the moving of the MS to Sicily and Southern Italy spur on a new study on the illustrations of the MS; models and figural sources of the Trojan Cycle illuminated on five folios, inserted as an introduction to the Iliad, are investigated. The attribution of the illustrations to a Sicilian milieu, suggested by Italo Furlan, is confirmed, as well as the influence of the Chronicle of John Skylitzes (Madrid, BNE, Vitr. 26-2) and of the Islamic paintings on the ceiling of the Palatine Chapel in Palermo. Yet many iconographical and stylistic references point to a date earlier than Furlan’s, to ca 1154-1180, under the Norman Kings, when a cultured secular society, open to a revival of ancient mythology, might promote the expressive scenes of the Judgment of Paris and the dramatic stories of Helene, Briseis and Chryseis, attuned to the aetas ovidiana which had begun to spread in the South of Italy from the end of the 11th cent. SUMMARY: The Iliad, Wrocl/ aw, Biblioteka Uniwersytecka, MS Rehdigeranus 26, written in Terra d’Otranto in the second half of the 13th cent. (1270 ca), is the third illustrated manuscript of the Iliad, after Milan, MS Ambrosianus F 205 inf. (5th cent.) and Venice, MS Marcianus Gr. 454 (Mid 10th cent. ), best-known as Ilias picta and Homerus Venetus A. The illustrated cycle in MS Rehd. 26 is an unicum also with regard to the other two famous illuminated manuscripts. This paper focuses on the full-page drawings (ff. 1r-3r), which illustrated the fundamental events of the poem. Iconographic analogies show connections with MS Marcianus Gr. 454, with the Crusader manuscripts, and with the paintings of Santa Maria della Croce in Casaranello (Lecce). SUMMARY: The only surviving copy of the Papal privilege of the year 1165 issued for the Church of St. Peter and Paul at Nesso (near Como) has been discovered among documents belonging to another ecclesiastical institution, in the State Archives of Milan: it is a simple copy written by Giovanni Paolo Stuppanus, a notary active in the city of Como in the late 16th and early 17th century. The document was mentioned in Paul Kehr’s Italia pontificia as: ‘‘Alexander III concedit privilegium’’, but Kehr did not had access to any copy of the text. The text is not a forgery and consecutive losses and recoveries of the document are related by Pietro Antono Tacchi, archpriest of Nesso in the late 17th century, who did his best in order to obtain it back. The privilege is an important source of information about the church itself, and is important also because it was issued by Alexander III during the first period of the schism, when Como and the surrounding area sided with the Emperor and Victor IV. SUMMARY: The ‘‘Charter of Niquinta’’ tells the meeting, in May 1167, at the initiative of the Church of Toulouse, of a multitude of men and women, in the presence of Papa Niquinta and five bishops. This strange document would be the only one that comes from those whom the Roman Church designated as ‘‘heretical’’ and whom we call ‘‘Cathars’’, but it was known to us, until recently, only through an edition of 1660. Its authenticity has been discussed, but the debate has been particularly strong since 1999. This article traces the positions of the debate, located in the perspective of the various interpretative currents of medieval heresy. SUMMARY: The antiphon devoted to Apostles O cohors milicie floris is one of the fourteen poems, that appear in the first visionary work composed by Hildegard von Bingen, the Scivias, and then are included in her poetic-liturgical cycle, the Symphonia armonie celestium revelationum. The manuscript tradition and the complex philological issues presented by the poem are discussed; a new critical edition is given, with fresh contributions to the text and a new Italian translation, suitable for the complexity of Hildegard’s poetry. A new interpretation of the poem is suggested by means of the analysis of the Biblical, theological and literary sources of the text, in order to deeply explain its meaning. Among the sources, besides the Bible and liturgical poetry, there are doctrinal and exegetical works of many Church Fathers (Augustin, Ambrose, Jerome, Gregory the Great), some medieval authors, like Rupert of Deutz, and the visionary works of Hildegard herself, especially the Scivias. Echi di Passio Agnetis BHL 156 – BHG 46 in un’orazione di Eustazio di Tessalonica? SUMMARY: In 1179, when the King of France’s daughter, Agnes, promised bride to Alexios II Komnenos, arrived in Constantinople, the Archbishop Eustathios of Thessalonike composed an oration, in which he underlined that, in spite of her young age, the princess already showed a ‘‘white-haired wisdom’’. Certainly, the recourse to the topos of the puella senex might be grounded on facts; but in this paper another hypothesis is suggested: the praise could be part of a more sophisticated rhetoric game in which the prelate aimed at associating, in an allusive way, the little princess with her patron saint, Agnes. In fact the text of Passio Agnetis BHL 156, which was immensely popular in the West and enjoyed a Greek translation (BHG 46), presented the twelve year old martyr corpore iuvencula sed animo cana (young in body, but white-haired in spirit) and gifted with a senectus mentis immensa (very old for her wisdom). SUMMARY: A 19th century copy of a document included in the lost Chartularium Culisanense (Collesano, near Palermo) is kept in the library of Montevergine (Campania). The copy was made around 1859 and signed for certification by mons. Benedetto D’Acquisto, archbishop of Monreale and professor of philosophy at Palermo. The document appears to be a letter, in Latin, dated 1st August 1205, sent by Theodore Angelos (Komnenos Doukas), brother of Michael Angelos, on behalf of his brother, to Pope Innocent III. In spite of several difficulties the document cannot be immediately discarded as a forgery, but deserves attention: it is fully analysed in its form and historical context. SUMMARY: MS Rouen, Bibliothe`que Municipale, Ms. I. 57, is a copy of the Articella, the famous collection of ancient medical texts translated into Latin and assembled in southern Italy in the eleventh century: the first complete description of this MS is here provided. The codicological description, especially of the decoration and of the arrangement, nature and version of the texts in the corpus has made possible to correct the traditional dating of the manuscript (14th century), and to assign its redaction to the 13th century in the context of the Paris university. This is a contribution to a catalogue of the preserved Articella manuscripts that would serve as the basis to understand the history and the transmission of this collection, used from the 11th to the 15th century for the teaching of medicine in the universities of Western Europe. SUMMARY: Book inventories of two Bologna teachers are here published and discussed. Thomas of Arezzo, physician and professor at the University, was implicated in an action in 1286; a double list of his books, 34 titles in all, is preserved among the records of his trial. Philip Christianus, teacher of grammar, sold his books in 1341: the bill of sale lists 41 titles. Most of them are texts of logic, philosophy, medicine, which Dante could have the opportunity to read, when he was in Bologna (ca. 1292-1294) in order to study philosophy. In Thomas of Arezzo’s inventory some works are remarkable: these are the texts by Boetius of Dacia and Siger of Brabant, which appear to be read in Bologna in spite of the recent condemnation by the bishop of Paris. Ambrosiani incipiunt adventum...: le liturgie ambrosiana e romana a confronto nel sermonario Ambr. A 12 sup. SUMMARY: In Milan two different liturgical rites have been practiced side by side in the late Middle Ages: the peculiar Ambrosian liturgy and the Roman liturgy, followed in convents and monasteries of regular orders inside the city. The MS Milano, Bibl. Ambrosiana, A 12 sup. is an important witness of this situation. Written in Italy in the early 14th century, this MS was later owned by the convent of S. Agostino in Cremona, Lombardy. In the 17th century, with a faked bookplate, it was included in a collection of MSS (about a hundred) sold by a forger as part of Petrarch’s library. It contains sermons mostly of Hugues de Saint-Cher OP, of Jean Bale ´trier OP, of Siboto OP and other authors. The sermons cover all the liturgical year and few feasts of the sanctoral, following the Roman liturgy and kalendar. The unique feature of this MS is a Kapitulare Epistularum and Evangeliorum for the temporale according to the Ambrosian rite, appended at the end by one of its early users. This sort of index of the biblical passages read during the Mass is concluded with comments on the differences between the Ambrosian and the Roman kalendars and rites. 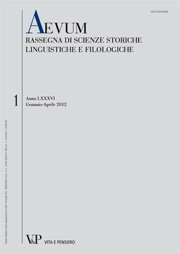 Le sezioni lambda e rho dell’Ecloga vocum atticarum aucta di Tommaso Magistro nel codice Ambrosiano M 51 sup. SUMMARY: Thomas Magistros’ Ecloga vocum atticarum is preserved in a manuscript owned by Giorgio Valla, datable to the first half of the 14th century (Milano, Biblioteca Ambrosiana, M 51 sup. [gr. 516], ff. 9r-240v). It was written in turn by several contemporary scribes that worked probably at Thessalonica. Three of them transcribed the Ecloga vocum atticarum and enlarged it with lexicographical excerpta (ascribed to Maximus Planudes, Manuel Moschopulos, Isidorus and Georgius Lacapenus) annotated on white pages at the end of the alphabetical sections. The glosses of the lambda and rho groups are edited and discussed. SUMMARY: A notarial deed, preserved in two later copies (both in the State Archives of Naples), and a papal letter, preserved in the original (in the same archival collection), report a dispute between the Neapolitan monasteries of S. Gregorio Armeno and S. Patrizia with the vicar of the archbishop of Naples, Bartolomeo Prignano, himself a Neapolitan of a merchant family and future pope Urban VI. Prignano imposed a tax on both monasteries, but the abbesses refused to pay it as an injust burden. The notarial deed (1360 October 23) is the submission to the vicar of a copy of the appeal presented by the abbesses to the papal Curia in Avignon. The papal letter (1361 March 1) tells the bishops of Nola, Pozzuoli and Caiazzo to examine and settle the controversy, with regard only to S. Gregorio Armeno. SUMMARY: This is a new chapter of a survey aiming at identifying and describing all manuscripts written by women up to the fifteenth century. The site http://edu.let.unicas.it/womediev/ lists 222 manuscripts and 204 names, the overwhelming majority of which belonging to nuns. A general review of the state of the art is followed by the description of five German and Latin manuscripts (Munich, Bayerische Staatsbibliothek, Cgm 851, 5139, 5235; Clm 10930, 283331), all dated or datable saec. XIV-XV, and a much older one (Wu¨rzburg, Universita¨tsbibliothek, M. p. th. f. 45), written by a rather mysterious scribe Abirhilt somewhere in Germany during the second half of the eighth century. SUMMARY: Alba Iulia (Romania), Batthyaneum Library, MS II.106 is a fifteenth-century book from Northern Italy, containing two hitherto unknown texts in Italian: a translation of William of Conches’ Moralium dogma philosophorum, and a version of the Summa de vitiis et virtutibus by the Bolognese Guido Fava. Both texts present a local vernacular version, which has not yet been identified among known manuscripts containing these volgarizzamenti. The present article brings the texts to light, and offers a full codicological analysis of the manuscript.